I don’t really consider this to have happened that long ago, nor was it one of my first shows, nor was it one of the best shows I’ve been to. In fact I hadn’t really considered it anything special at all, however one human year is equal to about 17 music years, which makes this Bauhaus reunion show I went to in 1998 ancient history, and considering the last person I debated the merits of various musical acts with WASN’T EVEN BORN when I went to this show I found it difficult to even find a basis of comparison on which to form my arguments. It’s not that I think all new music is crap, I definitely don’t. I listen to (and buy) lots of new music. It’s also not the case that the person I was arguing with hadn’t been exposed to music of the 90s and before, he most certainly had. What it came down to was that what I considered the classic musicians of my day, musicians who continue to have profound influence on new artists I listen to now, to him were simply “oldies“. They were the albums in his parents’ collection. 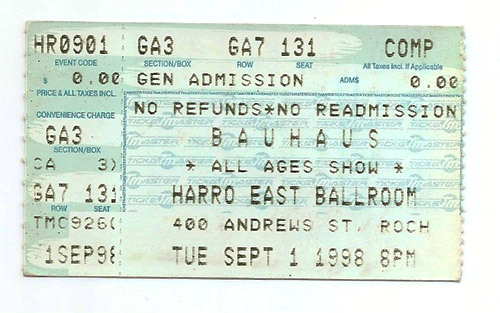 To him they sounded dated and unappealing, and to the degree that I lamented the fact that he would never have the opportunity to see a band like Bauhaus live, he equally couldn’t care. He was much more interested in explaining to me why 50 Cent was a master of rap and how much of a lasting impact he is already having on the genre.